Larix laricina, first described in 1773 by Karl Heinrich Emil Koch (1809–1879), is commonly known as Tamarack, Hackmatack, Eastern larch, Black larch, Red larch, or, more widely in the nursery trade as American larch. The word tamarack is the Algonquian name for the species and means “wood used for snowshoes.” The species name means “larch-like” in the Latin language, referring to its resemblance to European larch which Linnæus, at the time, called Pinus larix. Early settlers would leave a high stump after felling the tree. The stump would be harvested being careful to leave as much of the curving root system before extracting the stump from the ground. These naturally curved pieces of wood were then used to make ships knees in boat building to save the laborious process of steaming and then bending wood for the boat’s ribs. Traditional boat builders in northern New England still harvest tamarack for this purpose. Larix laricina (yellow fall colors), with Picea mariana (green) behind; northern Minnesota. Description. 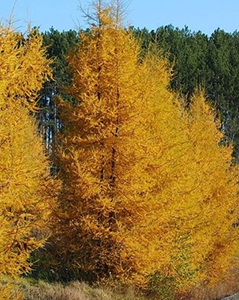 American larch is a small to medium-size boreal coniferous and deciduous tree reaching 30 to 60 feet (10 – 20 m) tall, with a trunk up to 24 inches (60 cm) diameter, measured at breast height. Bark is tight and flaky, pink, but under flaking bark it can appear reddish. Shoots are orange-brown in color and glabrous in texture. Buds are dark red, subtended by a ring of hairlike bracts and glabrous. Leaves are needle-like, 0.8 to 1.2 inches (2 – 3 cm) long, light blue-green in color, turning bright yellow before they fall in the autumn, leaving the pale pinkish-brown shoots bare until the next spring. The needles are produced spirally on long shoots and in dense clusters on long woody spur shoots. Seed cones are the smallest of any larch, only 0.4 to 0.9 inch (1 – 2.3 cm) long, with 12 to 25 seed scales; they are bright red in color at first, later turning brown and opening to release the seeds when mature, 4 to 6 months after pollination. Seed bodies are 0.08 to 0.12 inch (2 – 3 mm) long with 0.16 to 0.24 inch wings. soils such as sphagnum peat and woody peat. The tree is found on mineral soils that range from heavy clay to coarse sand; thus texture does not seem to be limiting. 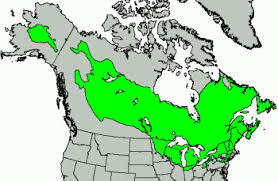 Although tamarack can grow well on calcareous soils, it is not abundant on the limestone areas of eastern Ontario. Tamarack is commonly an early invader. Tamarack is generally the first forest tree to invade filled-lake bogs. In the lake states, tamarack may appear first in the sedge mat, sphagnum moss, or not until the bog shrub stage. Farther north, it is the pioneer tree in the bog shrub stage. Tamarack is fairly well adapted to reproduce successfully on burns, so it is one of the common pioneers on sites in the boreal forest immediately after a fire. *It Should be mentioned that we haven’t had the greatest success with the Larch tree here in Cheyenne. With new cultivars and seed sources from trees that survive in other harsh environments like ours this could change in the future. There are some city owned Larch in Lions Park south of the Botanic Gardens conservatory and also located along the 4th hole at Airport Golf Course. Every tree is different though. You might find one that does excellent here.